This is something that I’ve been meaning to write about for a while – the exhaust silencer (muffler) fitted to the 360 is quite a piece of engineering. The silencer does a great job of keeping the sound levels down, that is until the exhaust tip valves open and then the full glory of the V8 engine is unleashed. 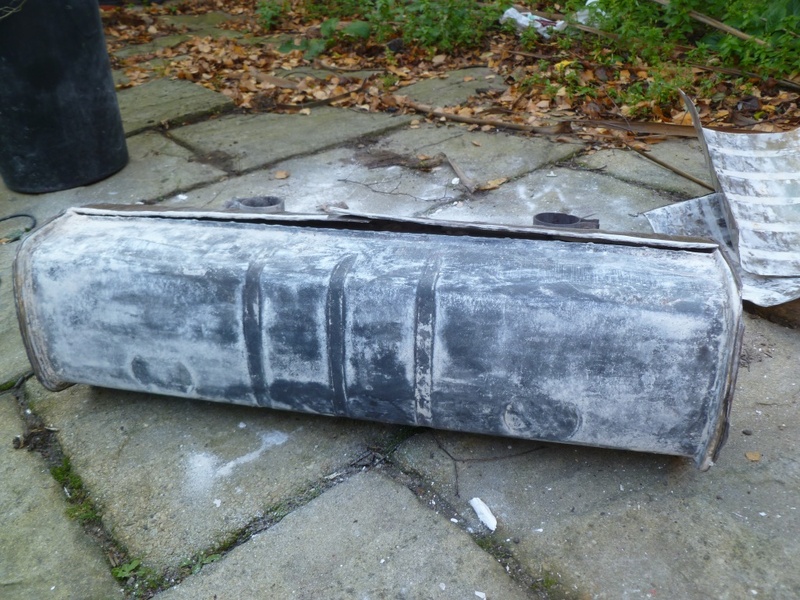 Firstly I’d like to show some pictures of a silencer with the outer skin removed. The main body of the silencer is wrapped in a solid white heat insulation which is then covered by a thin skin of stainless steel. 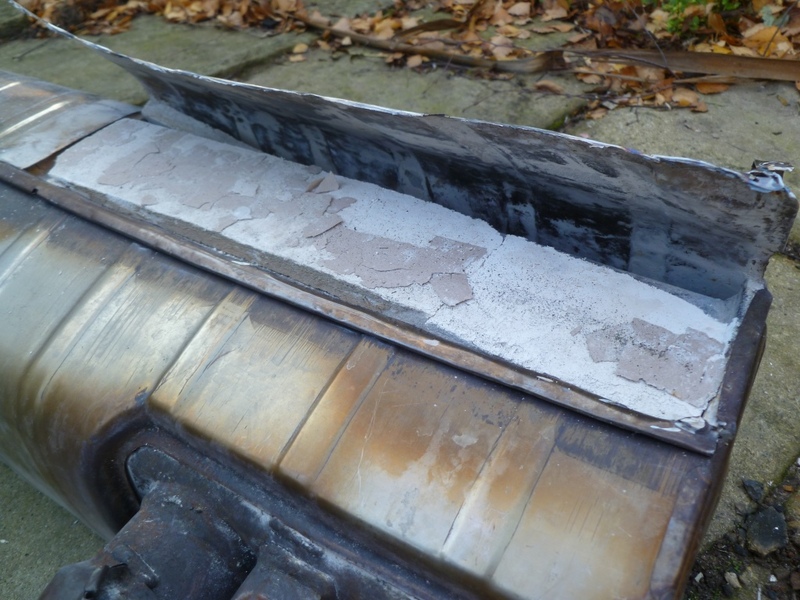 Over the years the white insulation breaks down and escapes from underneath the outer skin – the dust covers the entire engine bay. 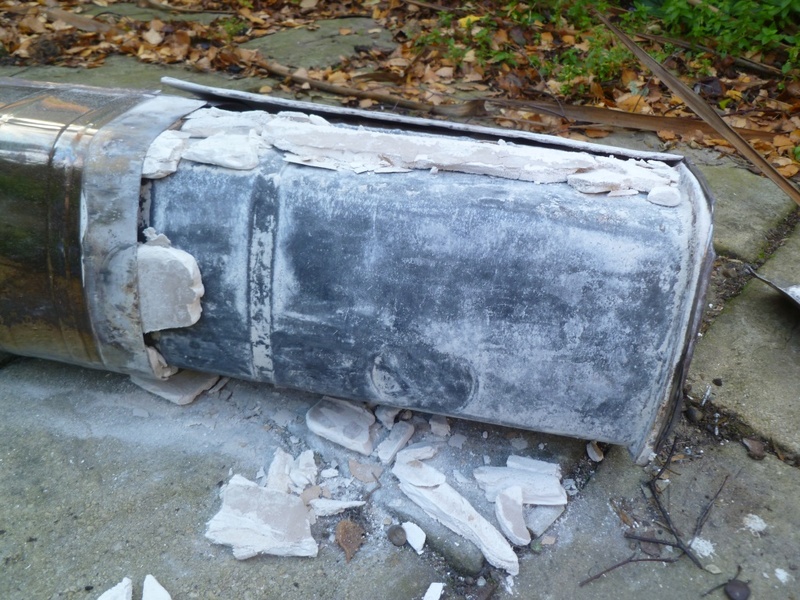 Although unsightly, the exhaust silencer will still operate properly. Since the engine is in a V configuration the pulses of exhaust gas fire from one side and then the other. This means that the pulses can cross over each other inside this chamber and escape easily through the other side. 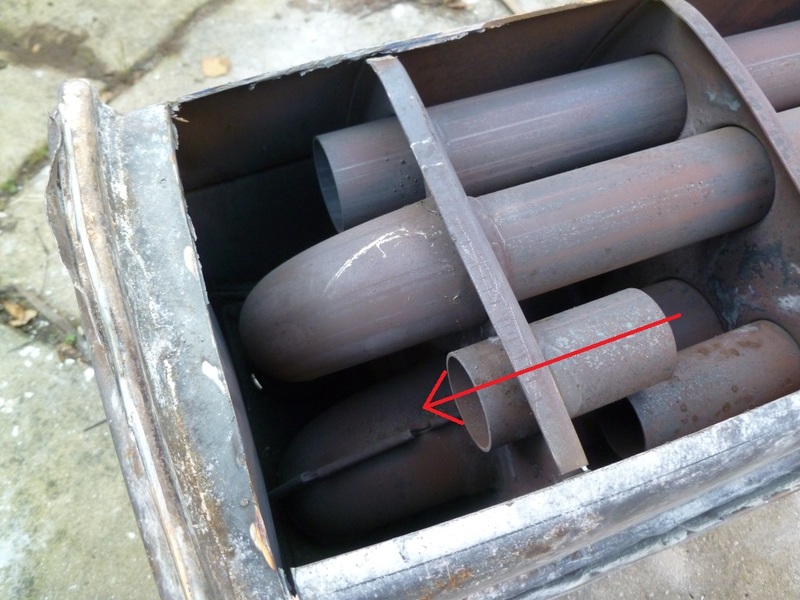 Now when the valves in the tips are closed the gases cannot escape out of the central chamber easily in this way. What happens is that the pressure in the chamber builds up and the gas escapes into the two inner chambers via two pipes. 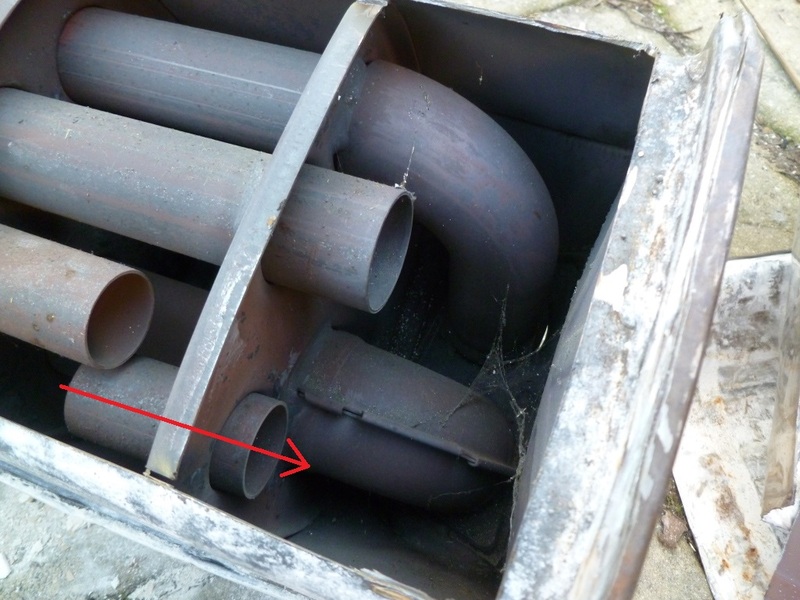 The gas enters these pipe through very small holes and allows the back pressure to build up. This complex arrangement provides good sound level reduction but comes at a significant weight penalty – the box weighs in at around 30kgs! If you enjoyed this post why not subscribe to this blog for further updates? Simply enter your email address in the box at the bottom of this page. Really good write-up that clearly shows how the silencer works….. I actually like the standard set-up and I’m looking for a cheap silencer to attempt a rebuild without the solid insulation. I was going to look at a number of alternatives. 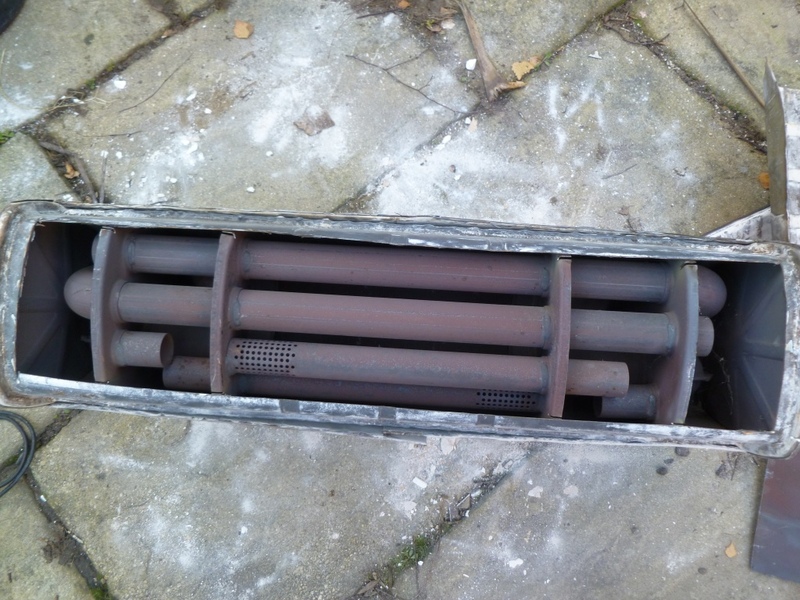 From your experience of taking this apart, do you think this is feasible and you could end up with a decent looking result. It would be entirely feasible to carefully take the outer skin off and remove the sold white insulation. You could then pack it with different insulation and re-fit the cover. I believe there’s a guy near silverstone who has done this before for the circuit’s experience cars – Pete Ellis of PTR exhausts. Fully agree with Mike M, great write up and photos, thanks. I have a standard silencer and I recently modified the values to stay open by splitting the vacuum pipes. I liked the sound outside the car but, after one trial run out, I decided to revert to the standard valves operation as I felt that there was a limited increase in “sound quality” inside the car (I have a Modena) unless the windows were open. Your write up though raises a question. If you do run with the valves permanently open is there any detrimental effect on the engine or catalytic converters running at lower RPM without the back pressure built up in the silencer? For example unburnt fuel arriving at the cats? I suppose it is entirely possible that the engineers at Maranello designed the engine with the valve overlap matched to the back pressure in the exhaust system. Your question is entirely valid and I don’t know for sure the correct answer. However, given the sheer number of cars running with the valves permanently open or with free flowing aftermarket exhausts I would say the risk is low – otherwise we’d see patterns of failure occurring. 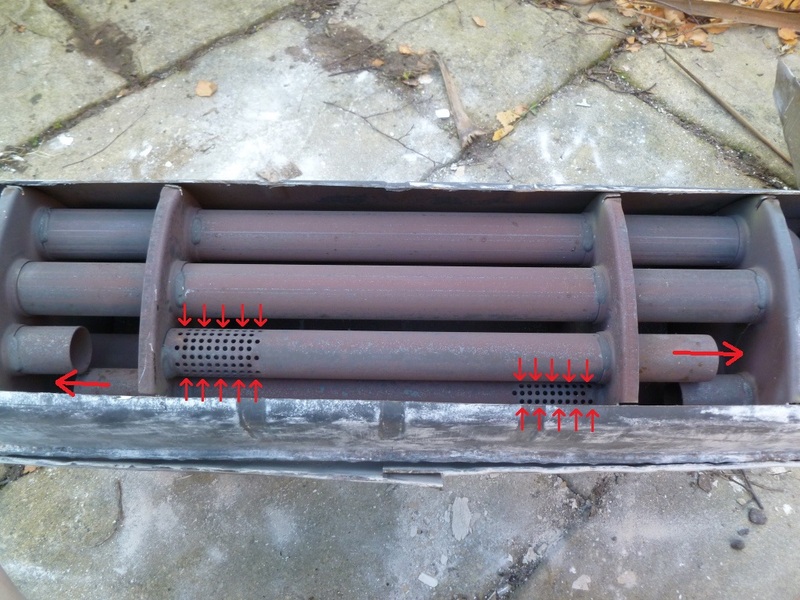 Great photos and explanation, I have just started to refurbish these silencers, doing exactly as you suggested, I wish that I had found this article beforehand! I carefully remove the outer cover then replace the solid iinsulation with a better quality high temperature mat, the outer case is then electro polished and refitted and any broken studs replaced. If any one needs further advice then pm me, I did try PTR but they said that they couldn’t help. I have the same problem with the white insulation. Can you tell me please what did you use to refit die silencer? I think that the spell checker has mangled your last few words “refit die silencer” ? I would like to know,what material did you use to refit the silencer? I use a specialist high temp fibre mat which gives a better fit than the board that Zeuna use. Have you removed the stainless steel coves? not yet. My Garage will do that for me. I just want to know in advance which material is the best. I have 2 silencers that I have refurbished, I can send pictures if you let me have an email address. It is quite a difficult job to get the s/s covers off so that they can be refitted, I had to use a specialist engineering company, which could refurbish yours if that’s of interest. pictures would be great. Can you please send them to p911cde@yahoo.de? Does this stock exhaust provide the best engine performance on the 360? Because of how it is intricately designed with the clever chambers and build up of back pressure? 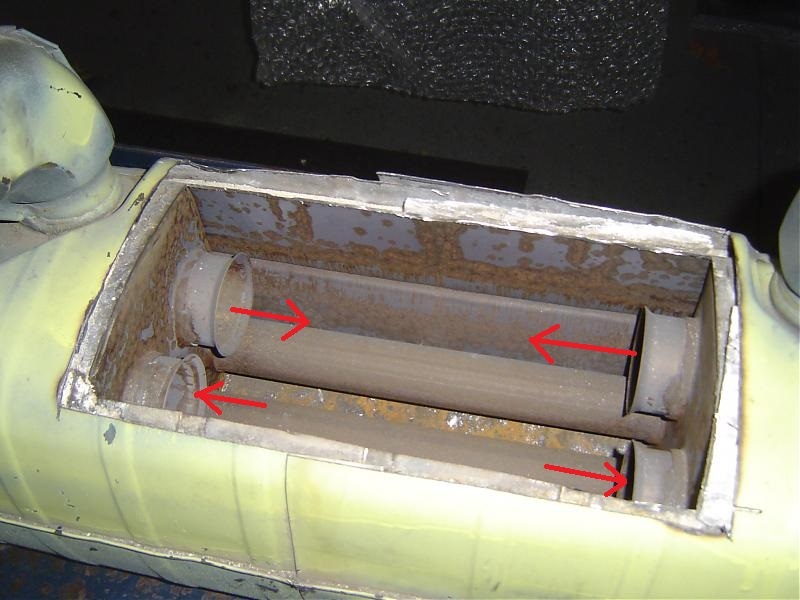 What does the inside of a tubi exhaust look like? 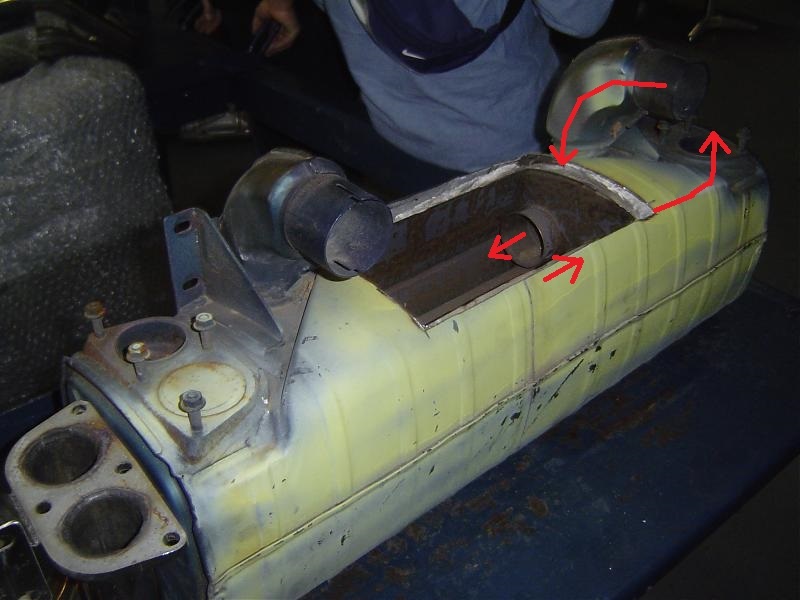 What happens to the gas flows in a tubi, especially if you use the stock exhaust tips with their valves in combination with a tubi silencer? I think the design offers the best balance between performance and noise reduction. I think it is not fully optimised for performance as the engineers used different designs in the challenge and challenge stradale cars. I’ve got no idea what the inside of a tubi looks like – they are too valuable to cut up!